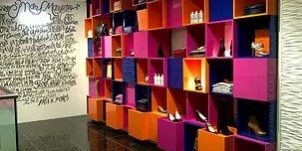 When used in the context of retail merchandising, visual merchandising is the activity of presenting products in a manner that encourages sales. Where competition for the customer’s attention and money has become fierce, learning to transform a retail environment into an appealing and stimulating platform for shopping is vital to any business, big or small. Let’s face it, visual merchandising makes stores more enjoyable for shoppers. By displaying and promoting your products in a manner that encourages higher sales, you will subsequently create a more enjoyable shopping experience. Shoppers will appreciate the attention to detail that goes into your window displays and other visual merchandising material, because it’s the small things such as this that will make your store stand out from the rest. In order to create a good story you must: Create a Focus Point, Don’t Mix Messages, Light it properly. Successful retailers make frequent floor moves for two good reasons. Every floor move re-energizes the merchandise, and keeps the products in front of frequent customers, subsequently building the brand messaging and awareness. Well Stores need to update their retail display fixtures immediately after a holiday has passed. Retailers should consider preparing a well-though-out time schedule which keeps displays and merchandise moving freely, in and out of the windows and the store.